For the longest time, traveling light with an interchangeable lens camera meant working with a prime lens. But optical technology continues to improve, and now nimble photographers have a limited selection of zooms that are just as compact as their prime counterparts. Here are two fine examples. The HD PENTAX DA 18-50mm f/4.0-5.6 DC WR RE ($297) and the Olympus M.Zuiko Digital ED 14-42mm f/3.5-5.6 EZ ($199) with accessory LC-37C Auto Open Lens Cap ($29) are as compact (or even more so) than most of their prime counterparts. Yet, these optics provide moderately wide to mild telephoto fields of view, making them excellent choices for photographers on the go who want to travel light. I took both of these optics out for a spin one Sunday morning. No other lenses were with me, so it would be make or break with these zooms. I used a Pentax KP DSLR ($896) and an Olympus PEN-F ($1,199) mirrorless as my camera bodies. Both of these are compact in their own right, and are perfect hosts for these optics. 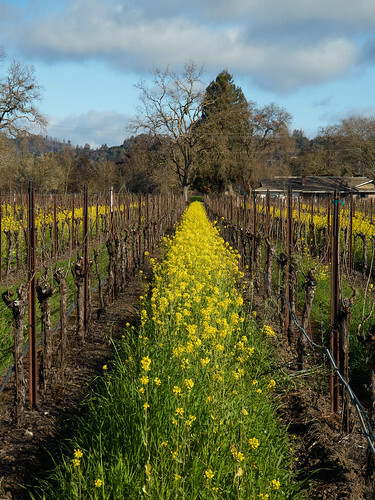 "Mustard in Vineyard" - Pentax KP DSLR with HD PENTAX DA 18-50mm f/4.0-5.6 DC WR RE captured in Program mode as a DNG. Photo by Derrick Story. The Pentax compact zoom was released a couple years ago. It received mixed reviews from users, not so much for its optical performance, but because of its usability. You have to press a button on the left side of the lens, then rotate the collar before you can take a picture. At first, this seems a little cumbersome. But I figured out that there's a grip on the opposite side of the collar for the opposing finger. Once you hold it according to design, the lens opens right up. As for image quality, I was really impressed. Colors are tremendous. I didn't use any filtration for these images. They were sharp and saturated at capture. On close inspection, center sharpness was excellent, and edge sharpness was very good. Focusing is extremely fast. The lens is very light because of its plastic body. Some users prefer metal. But its this very design that makes it as light as it is compact. In short, this is a wonderful optic for outdoor use, perfect for travelers and those who want a compact DSLR package. 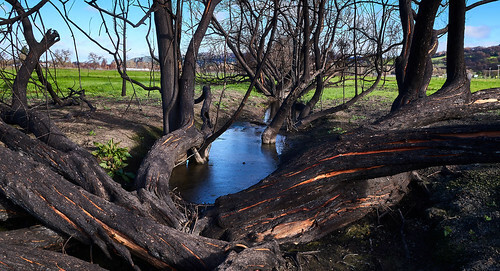 "Victims of the Tubbs Fire" - Pentax KP DSLR with HD PENTAX DA 18-50mm f/4.0-5.6 DC WR RE captured in Program mode as a DNG. Photo by Derrick Story. The Olympus kit performed well also. Because it is a micro four third body and lacks a mirror, it's even more compact than the Pentax KP. If you don't mind an electronic viewfinder instead of an optical version, you can save even more room with this package. Olympus PEN-F with Olympus M.Zuiko Digital ED 14-42mm f/3.5-5.6 EZ. In fact, this pancake zoom is more compact than most prime lenses for micro four thirds. One of its clever tricks is that it auto extends when you power up the camera. If you add the accessory LC-37C Auto Open Lens Cap, then it's ready to shoot in a second. This combination is particularly effective for street photography and travel. You can stash the PEN-F in a jacket pocket while exploring, but be ready to shoot in just a second or two. Image quality is very good, again with a little tradeoff on the edges. Both of these optics have a high nimbleosity rating and are excellent performers as well. Street photographers and urban travelers would appreciate the convenience of the PEN-F kit. Those who love the visual beauty of an optical viewfinder can travel light as well with the Pentax KP kit. And if landscape photography is your thing, this DSLR is hard to beat. We're no longer limited to prime lenses for compact, lightweight travel shooting. These zooms, and others like them, are truly game-changers. This is The Digital Story Podcast #623, Feb. 20, 2018. Today's theme is "Should Our Cameras Be as Smart as Our Phones?" I'm Derrick Story. I've been thinking about how the camera industry could better combat the encroaching smartphone phenomenon that is eroding their marketshare. Should Nikon, Canon, Sony, Olympus, and Fuji tap computational photography for their devices? Or would another approach make more sense? I address this issue on today's TDS podcast. Should Our Cameras Be as Smart as Our Phones? I was up early shooting on Sunday morning. The air was crisp and clear, and the breeze hadn't kicked up yet. So off I went with my iPhone X, Pentax KP DSLR, and Olympus PEN mirrorless. My experience changed noticeably as I switched from camera to camera. 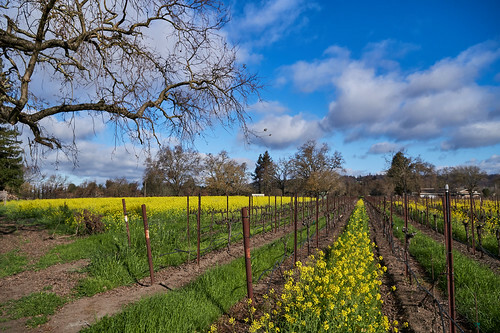 Standing there in the middle of a vineyard, the most visually delicious visuals were looking through the optical viewfinder of the Pentax DSLR. Everything was so beautiful, and it inspired me to compose the best shots possible. The electronic viewfinder on the PEN-F was also satisfying, but in a different way. It was like I was in a darkened theater watching the scene on a screen. And it had the advantage of presenting me with realtime exposure compensation feedback. The iPhone was the least satisfying. Seems like composing on its amply-sized LCD should have been engaging. But I found it far less inspiring than my dedicated cameras. This got me thinking about approaches that camera companies, and you and me, could take when encouraging aspiring artists to add a dedicated camera to their toolset. Here are my five favorites. Emphasize your strengths. Create viewing experiences that can't be matched on a smartphone. Continue to develop tempting lens options, and possibly create more interchangeability among brands. Look how well Olympus and Panasonic have fared by doing so. Add a computational photography mode to help those making the transition from smartphones to cameras. I know there are scene detection modes now, but they pale in comparison to what we experience with mobile devices. Don't try to compete on the selfie level, emphasize important life events such as travel, weddings, and art. Continue to explore the design aesthetic. Smartphones are hampered by the need to fit slimly in one's pocket. But cameras have far more latitude with design, and that should be tapped. Becoming smarter is only part of the answer. Camera manufacturers have so many assets they can leverage. They just need to focus. I'm now moderating the Skylum Photography Public Group, and I would love to have interested members from our audience join me there. I've published an informative article on the San Francisco Street Photography Workshop that you may want to take a look at. I've started a new Instagram feed just for film camera lovers. It's called TheFilmCameraProject, and it's for those who appreciate the beauty of analog SLRs. 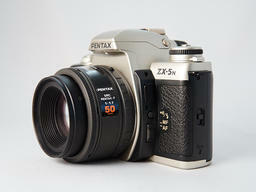 And to celebrate the launch, I'm giving away one Pentax SLR and lens to one lucky follower of TheFilmCameraProject. All you have to do is follow the feed by Feb. 28, 2018. I'll then do a random drawing and announce the winner on the March 6 podcast. Join in the fun, and get to admire some really beautiful camera along the way. 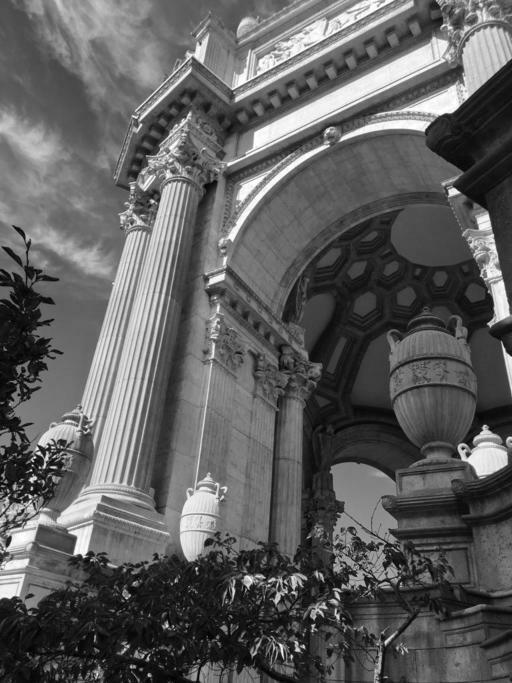 Our next Nimble Classroom is on March 10, Build Your Digital Darkroom with Photos. Here's why you might want to attend. I now have the dates for the Sonoma Country Hot Air Balloon and Drone Photography Workshop, June 8-10, 2018. We're combining two very fun aerial activities into one workshop. Be sure to get on the Reserve List for this one! Break the electronic shackles of work and set aside some time to focus on your craft. 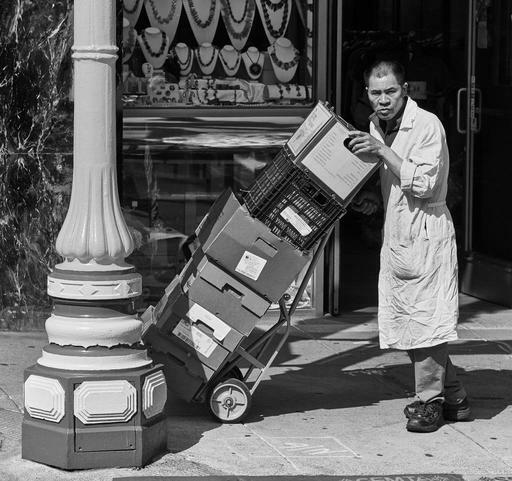 Join us in April for the San Francisco Street Photography Workshop. It's time to get your urban on. Our headquarters is located in the heart of the city at the Cartwright Hotel. Walk out the door, and the world is ready for your camera. 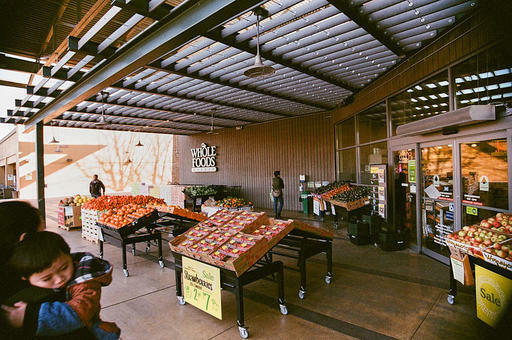 For three days you will live, eat, and breath urban photography with your fellow workshop participants and facilitators Derrick Story and Olympus Visionary Mike Boening. 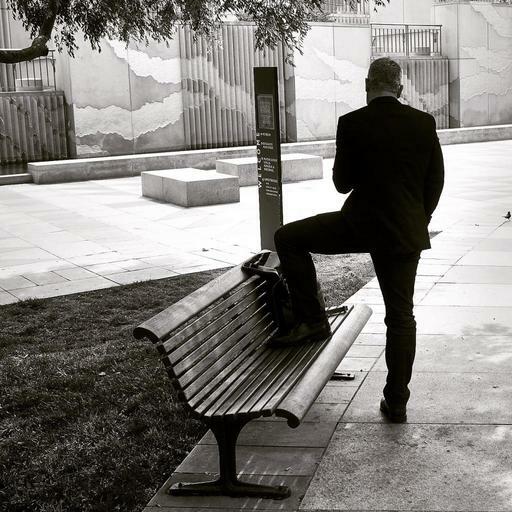 Through classroom instruction and led explorations to visually interesting corners of the city, you will capture a bounty of images. And if you're interested in mirrorless gear, we will have some of the coolest street photography cameras, lenses, and bags available for your to try. We begin with an informal reception on Wednesday, April 25 in the historic Cartwright Hotel. You'll have a chance to meet your fellow photographers and learn about the activities that lie ahead. We then get to work first thing Thursday morning, and for the next three days, urban photography is your life. We take care of the details so you can focus on your craft. We'll travel on foot, by streetcar, and of course cable cars as well. Every moment is a potential photograph. If this sounds like the getaway that you need to reenergize your artistic eye, then sign up today for the event. Group is limited to eight, two instructors, and an entire city just waiting for you. I received an image request the other morning for a photo that I captured in 2014. Those were Aperture days for me, so I went upstairs to the archive room, fired up the Drobos, and launched the appropriate Aperture library. In 2014, I loved Aperture. I thought it was some of the finest software that Apple had designed. But on this morning, I was impatient with it. And for the first time, the interface looked a bit dated. Then I realized... the infatuation was over. At that moment, I decided to finally migrate that 1TB archive to Capture One Pro 11. Thanks to the easy import command (File > Import Catalog > Aperture Library), I knew that the computer would handle all of the heavy lifting. All I had to do was use another machine for a day or so. So I set up a new Capture One Catalog, and initiated the process. Capture One Pro is exceedingly good at this transition. Most of the library structure migrates, sans Smart Albums. Many of the image adjustments carry over as well. And all of the metadata, including my star ratings and IPTC were welcomed in their new home. A day and a half went by, and the job was complete. At first, performance was a bit funky. So I quit Capture One, counted to 10, then relaunched the app. Ah, much better. And the more I browsed, the better the performance became. The pleasant surprise was the improved RAW processing in Capture One. All of my shots looked better. That subtle contrast enhancement that's in the Capture One secret sauce really played out nicely with my older photos. My cropping carried over as well. Yay! I recommend that you keep separate Capture One catalogs for your archives. Mine are on Drobos with Thunderbolt connections. Performance is good enough for browsing, enhancing, and exporting older shots. I still have my Aperture archives as well. It's just disk space, and that seems like a cheap enough insurance policy in case something goes wrong. Aperture and I had a wonderful relationship. But for now, Capture One Pro is looking after my archives. When riding my Cannondale Bad Boy bike, I want to remove as many barriers as possible to my stopping and capturing a photo. I've learned over the years that having a camera tucked away in a backpack or on the rack reduces the number of images. To solve that problem, I configured a DIY bike holster for the front handlebars. Most of us have one of these top loaders stashed in the closet. 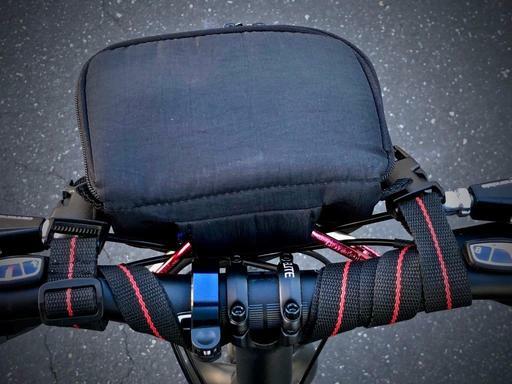 Simply shorten the strap to its minimum length and wrap it around the handlebars as shown below. Don't interfere with any of the braking or shifting cables. The weight of the camera does a good job of keeping the holster in the down position. But for added security, I ran 3 carabiners through the back loop. 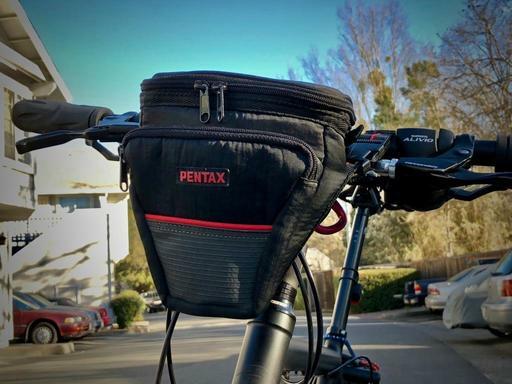 This is mainly for riding without a camera in the bag so it doesn't flop around. Now, when I see a photo opp, it's easy to pull out the camera and shoot. If I make a stop at a retail location, I can easily take the holster with me. Most of the time, however, I just pull the camera out and leave the bag open on the handlebars. And yes, as a result of this rig, I'm shooting more on my riding errands. This is The Digital Story Podcast #622, Feb. 13, 2018. Today's theme is "A Personal Photo Essay." I'm Derrick Story. Some of the most interesting photo essays that I've seen over the years are those where the photographer is allowed inside someone's life in their home. It's fascinating to peer behind the curtain of their life, and think about how it compares to mine. But what if we told our own story, from our personal point of view? I talk about this project that anyone can do, with any camera, on this week's photography podcast. This all started one afternoon when I was writing in the main room of my studio. The winter light was streaming in from the big window facing south, and it illumined a work table where I had some of my things. As I looked at the scene, I thought, this one picture says a lot about my interests. 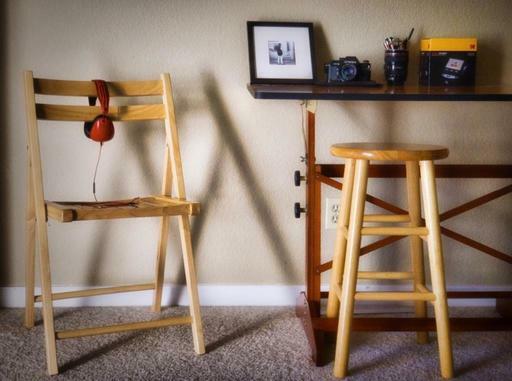 There were a pair of red headphones hanging on the chair, a B&W print on the table, a Contax film camera, pens in a fake lens cup, and a Kodak scanner that I'll be reviewing soon. Wouldn't it be fun to do a photo essay on a day in my life here? I would take pictures of the kitchen (where I spend too much time), Dibs, Studio A, Studio B, my washer that doesn't fit quite right in the laundry room, backdrops hung over the balcony rail upstairs, and on and on. Imagine someone finding this photo essay years later? They would learn so much about me. And even on a practical level, many of these images would be helpful for insurance claims if something bad happened here in the near future. So here are five tips that I have to help encourage you to endeavor your own personal photo essay. Look for scenes that really represent you - Your clothes hanging in the closet, your workroom, the car outside. Tidy, but don't over organize. Since it's a photo essay, we do want the images to look good. But don't over organize losing the soul and personality of the scene. Keep it to 36 exposures. I think 36 is a magic number here. It's a roll of 35mm film, a nice length for a slideshow, enough to tell the story, not so many that it becomes boring. Write captions for the shots. Images do say a lot, but a few additional words say even more. Finish the project. Build a slideshow, create a gallery that's saved as PDF, etc. Part of the beauty of this project is that it can be shared, discovered, and viewed. LRTimelapse is without a doubt the best piece of software to manage extreme day-to-night and night-to-day transition when capturing a time-lapse sequence. This flicker remover program changed the industry for good and a new version with many improvements has just been announcement by its creator. Here is what you need to know about it. LRTimelapse 5 is a big upgrade from version 4 but the workflow remains similar. The first thing you'll notice on LRT5 is the polished user interface. The buttons and icons look nicer and the interface is completely scalable for high-resolution monitors. Seasoned LRTimelapse users won't be lost but everything is better and faster thanks to the optimization and improved use of multithreading platforms. The program can now handle up to 32 threads. Reservation forms have been sent to Reserve List members. If you signed up on the Reserve List, but didn't receive an invite, please email me. The latest training videos posted for our Inner Circle members are processing aerial photographs in Luminar and using Lightroom for time-lapse photography. I've been fairly resourceful over the years with my aging handsets. They've served as loaners for my boys when their devices went south. 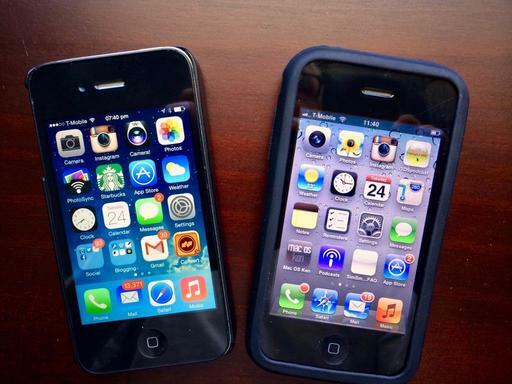 I've traveled abroad with 3-year-old iPhones and got by just fine. But I still have one or two that I haven't been able to find encore careers for. A company called manything may change that. I learned about them through an article on Digital Camera World titled, This app will turn your old phone or tablet into a home security camera. Essentially, the way it works, is that you can use a device as old as an iPhone 3GS or Sansung Galaxy S3 and repurpose it as a home security camera. Features include live streaming, motion alerts, remote control, and clever motion detection. You can even configure your setup to turn on the lights if something is moving around in the house (might not be great for pet owners...). They have a few different plans, including a free one that enables one device with live streaming, motion alerts, and detection zones. Other plans that include more cameras and cloud storage for video range from $6 a month to $20 a month. All in all, the costs seem reasonable for the services offered. I'm going to give the free plan a spin. I have a spare iPhone that would make a perfect security camera. I'll let you know how it turns out. Spots, blemishes, and scratches are easily fixed using the Retouch Tool in Photos for macOS. Because it's so easy to use, some downplay its power. Watch this video to see what Retouch is great at, and the corrections that may require a different approach. And for those pesky jobs that are a bit challenging for Photos' Retouch Tool, you can still remain in your workflow by using the Erase Tool and Clone & Stamp in the Luminar Editing Extension that comes bundled with the standalone application. The Retouch Tool in Photos for macOS can handle most jobs. But if your need more, add Luminar to your workflow. Regardless of which approach you take, these tools are very powerful and non-destructive. This is The Digital Story Podcast #621, Feb. 6, 2018. 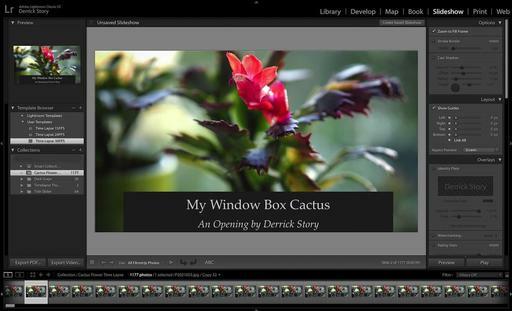 Today's theme is "Using Lightroom for Time-Lapse Photography" I'm Derrick Story. One of the joys of mirrorless photography is that the cameras typically have an extensive feature set, including an interval timer for time-lapse photography. But, once we've captured the frames, what's an easy way to render the movie? Did you know that Lightroom can handle it? It can, and I explain how in today's TDS photography podcast. On my Olympus cameras, if I go to the bottom of Camera Menu 1, I can set up an interval program to capture thousands of frames over a period of time. Also, using the Cascable app's Shutter Robot, I can also set up a time-lapse program. And after a few hours, I have thousands of images on my memory card. But then what? I wanted to find an easy way to render an HD movie from those pictures, have the ability to manage and edit the frames, use software that worked on both platforms, and didn't cost me anything more than what I've already invested in my gear. The solution that surfaced: Lightroom Classic CC. The only missing ingredient is a set of templates that you can download for free via an article on the Adobe blog titled, To the fast lane of time-lapse with Photoshop Lightroom. Once you have the templates installed in the Slideshow module, you can take all those frames you've captured and convert them into an HD movie. If you want to see the time lapse that I created, you can watch it here. I've also published a 16-minute video tutorial for our Inner Circle Members that walks you through all the steps. 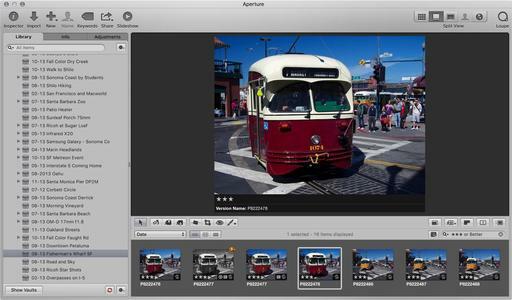 After watching that, you'll be ready to create your own time-lapse movie with Lightroom. 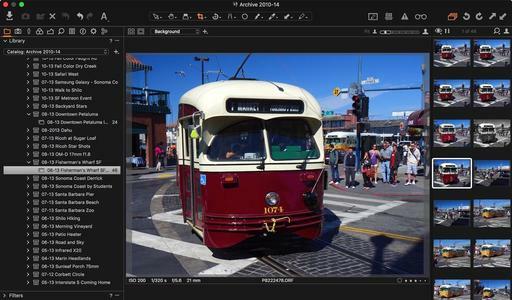 We have our first Nimble Class this coming Saturday, Layers in Capture One Pro 11. The headline new feature in Capture One Pro 11 is the redesigned layers area for localized editing. In this classroom, Derrick Story shows you best practices for working with layers in Capture One Pro 11. Class participants may submit their unique questions before class, allowing Derrick to incorporate that content into his teaching. And there will be live Q&A sessions throughout the course. There are a lot of rules in photography that we just follow. Yes, they are based on some technical merit, but maybe we're overlooking creative possibilities by blindly adhering to them. 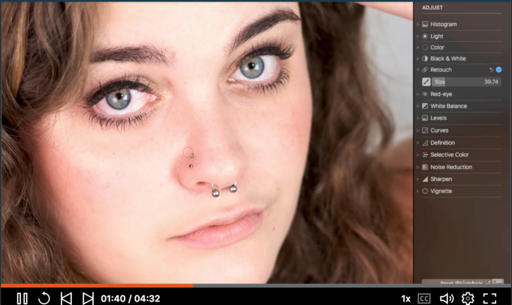 For example, the notion that one should never use a cropped lens on a full frame camera. Have you looked in to this for your brand? "Shopping Day" - Pentax DA 20-40mm zoom at 20mm on a Pentax Program Plus body, Fuji Superia 400 film. Photo by Derrick Story. I have this lens that I just absolutely love - the Pentax DA 20-40mm zoom. It's my go-to optic for my Pentax KP DSLR with a cropped sensor. So I mounted the Pentax DA 20-40mm zoom on my film SLRs and started shooting. And the results are terrific. The only downside, as you already know, is some vignetting. It's more pronounced in some pictures than others, depending on focal length, aperture, and lighting. There are times when I actually like the effect, and others where I have to downplay it in software. In the case of the "Shopping Day" photo, I like it. 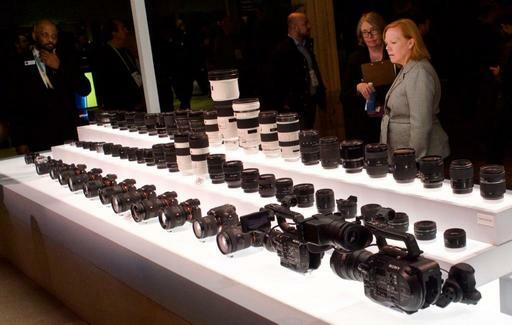 The bottom line is, now I have my entire lens arsenal available for all of my cameras. And depending on the brand you shoot, you too may have more options than you realize. But please: Do your research first (I did). Not all brands have the same lens compatibility that Pentax does. Be sure that you are not going to damage your equipment. Safety first, right? But if there isn't a physical reason why you shouldn't put a cropped lens on a full frame body, then why not experiment? If you have any experiences with your brand that you'd like to share, please post a comment on our TDS Facebook page where I'll have this story.